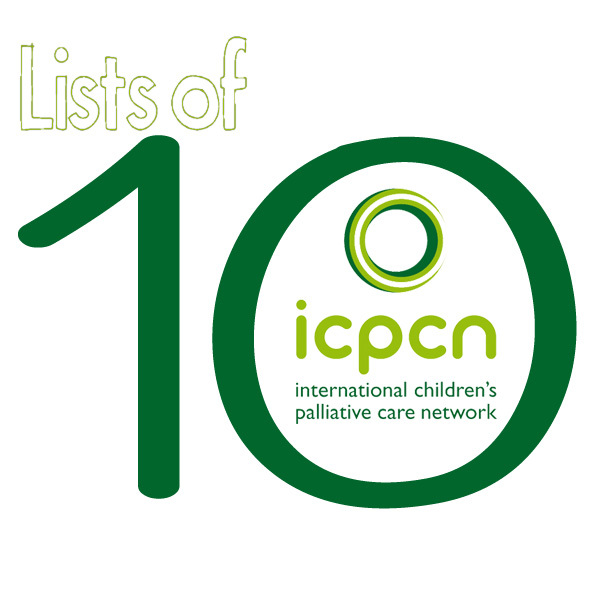 As ICPCN celebrates its 10 year anniversary in 2015 as the only charity fighting internationally for the rights of children with life threatening and life limiting conditions to receive palliative care, and as part of our NOW campaign, we will be posting regular ‘Lists of 10 things’ about children’s palliative care to social media and on our websites. The lists will be written in plain language and highlight various aspects of children’s palliative care with the aim of increasing the general public’s understanding of issues related to the field and raising awareness. Each list is available as a PDF download. We encourage you to download the lists below, share with friends and colleagues, print out, display and distribute as far and as wide as you possibly can. We need your help to get the message out that NOW is the time to demand that all children with life threatening and life limiting conditions receive palliative care. The word ‘palliate’ is derived from the Latin pallium meaning ‘cloak’ and means to make something less painful or unpleasant. Palliative care is appropriate for all children diagnosed with a life-limiting or life-threatening condition. A life-limiting condition is one where there is no reasonable hope of cure and from which the child will die at some stage. A life-threatening condition is one where a cure is possible but can fail. The best time to begin to offer palliative care is at the time of diagnosis. Providing palliative care should never be seen as ‘giving up’ as its purpose is to enhance the child’s quality of life. There are significant differences between adult and children’s palliative care. 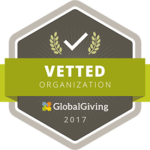 Children’s palliative care is provided by a team who work together to relieve the suffering of the child and the child’s family in every way possible. Children are valued members of the care team and are encouraged to take part in making decisions about their own care. While children’s hospices offer palliative care, it is also provided in many other settings, such as hospitals, clinics, and in the child’s own home. Palliative care for children can be provided in places with limited resources. Every child should expect individualised, culturally and age appropriate palliative care as defined by the World Health Organization (WHO) The specific needs of adolescents and young people shall be addressed and planned for. Palliative care for the child and family shall begin at the time of diagnosis and continue alongside any curative treatments throughout the child’s illness, during death and in bereavement. The aim of palliative care shall be to relieve suffering and promote quality of life. 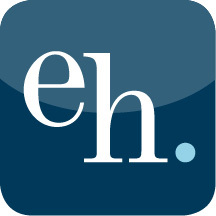 The child’s parents or legal guardians shall be acknowledged as the primary care givers and recognised as full partners in all care and decisions involving their child. Every child shall be encouraged to participate in decisions affecting his or her care, according to age and understanding. A sensitive but honest approach will be the basis of all communication with the child and the child’s family. They shall be treated with dignity and given privacy irrespective of physical or intellectual capacity. Every child or young person shall have access to education and wherever possible be provided with opportunities to play, access leisure opportunities, interact with siblings and friends and participate in normal childhood activities. The child and the family shall be given the opportunity to consult with a paediatric specialist with particular knowledge of the child’s condition where possible, and shall remain under the care of a paediatrician or doctor with paediatric knowledge and experience. The child and the family shall be entitled to a named and accessible key-worker whose task it is to build, co-ordinate and maintain appropriate support systems which should include a multi-disciplinary care team and appropriate community resources. The child’s home shall remain the centre of care whenever possible. Treatment outside of this home shall be in a child-centred environment by staff and volunteers, trained in palliative care of children. Every child and family member, including siblings, shall receive culturally appropriate, clinical, emotional, psychosocial and spiritual support in order to meet their particular needs. Bereavement support for the child’s family shall be available for as long as it is required. Children are not ‘small adults’ so all treatment is child focused. 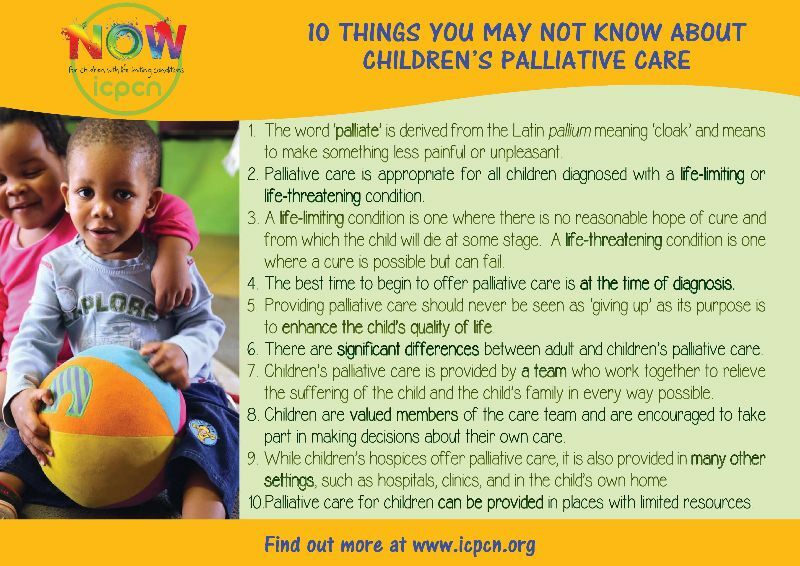 Children’s palliative care spans neonates, babies, toddlers, school children, adolescents and young adults. Each age group requires a different approach. Many rare conditions will never be encountered in the adult population. Multiple family members can be affected by the same genetic condition. The time span of a life limiting condition may extend to years and even decades. Some patients will need assistance to transition from child centered to adult palliative care services. Care embraces parents, siblings and grandparents, all of whom are vulnerable as they face the changes to their lives that the child’s diagnosis creates and as they anticipate bereavement. The child’s physical, social, emotional and cognitive development continues and must be catered for. Medicine dosages change as the child grows. Carers must respond appropriately to each child’s changing ability to communicate and to understand what is happening to them. Provision for continuing education and opportunities to play are a child’s right, adding to the complexity of their care. Childhood cancer causes around 90,000 deaths per year and in high-income countries is the second highest cause of death among 5 – 14 year olds. The latest rug developed for childhood cancer in the US was 30 years ago. Children/adolescents with cancer suffer as a result of sever and toxic treatments which cause lifelong health issues and challenges. In most low and middle income countries, palliative care services for children are limited and pain relief medications are frequently unavailable. Hospice and palliative care treatment for adults can be slightly adjusted to accommodate children. Hospice and palliative care is only for those who have cancer. Hospice and palliative care is only appropriate at the end of life. Accessing hospice and palliative care means that you are giving up hope. Working in a children’s hospice or palliative care services is sad and depressing. It is not appropriate to give children opioid medications to treat their pain. Children and adolescents should not be burdened with the responsibility of helping to make decisions about their various treatment options. Children should always be protected from the knowledge that they are dying. Children don’t want to talk about their death and what matters to them. Ensure that there is a shared vision of what is needed for young people with life-limiting conditions as they move in to adulthood. Establish Regional Action Groups that will lead to new partnerships and service developments by bringing together young people, service providers and service funders. Get all agencies together to discuss, plan and work collaboratively across regions. Gather evidence of what is needed in local areas, through exploring what services are available locally and identifying who the young people are. Enable young people to share their stories and help them to articulate their own aspirations for the future. Boost the confidence and skills of professionals working with young people with life-limiting conditions. Raise public and professional awareness of the needs and aspirations of young people with life-limiting conditions. Engage communities and volunteers in supporting young people to achieve their aspirations. Lobby for the needs of young people with life-limiting conditions. Achieve sustainable funding, which must underpin all of the above. ICPCN is the only international charity networking individuals and organisations from around the world who work in Children’s Palliative Care (CPC). 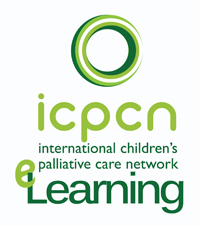 ICPCN is the only provider of free e-learning courses on CPC in 8 languages. 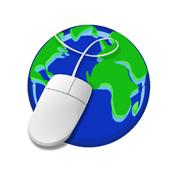 ICPCN lists events and conferences from around the world relevant to CPC. ICPCN ensures the voice of children are heard by representation on the boards of the Worldwide Hospice Palliative Care Alliance (WHPCA); the International Association of Hospice and Palliative Care (IAHPC); the European Association for Palliative Care (EAPC); the African Palliative Care Association (APCA) and the UN Social Protection, Care and Support Working Group. ICPCN has provided training in CPC, held Train the Trainer courses, workshops and seminars for groups of multi-professionals in 17 countries affecting hundreds of professionals and leading to better care for thousands of children. ICPCN carried out crucial research with UNICEF to calculate the global need for children’s palliative care and a method of calculating the need in individual countries. Through strategic partnerships, ICPCN has been instrumental in developing a strategic network of services to provide CPC in Malawi, Tanzania, Uganda and the Maharashtra district of India. 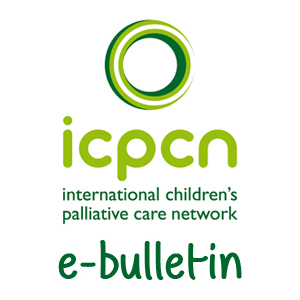 ICPCN is responsible for the only international news platform dedicated to events, research and developments in CPC – the international children’s edition of ehospice. ICPCN has raised the profile of CPC in developing countries by supporting the very first children’s palliative care conferences held in South Africa and India. ICPCN is the only global charity advocating for the rights of all children with life-limiting and life-threatening conditions to receive palliative care at the World Health Assembly.